The progressive governance dialogues began at the close of the 20th century after the fall of the Berlin Wall. The collapse of the Soviet system did not bring about “the end of history”, as some claimed. It did, however, inspired a fundamental rethinking among social democrats and progressives about how to approach a new world order characterized by globalization and the information technologies revolution. In parallel with the technological development, an increasingly complex set of societal changes were taking place: strict social classes, the nuclear family, and traditional gendered roles were giving way to a more diverse postmodern society. In this context, it had become increasingly apparent that progressive politics needed to find fresh answers to both, the new and the traditional challenges of our world. The Third Way renewal of progressive politics, which shaped these discussions, sought to accept the strengths of some areas of the economy and understand the limits of others. Thus, the challenge became about identifying how public policies could combine the capacities of the State, social groups, and civil society with the market forces. This entailed not only a new set of policies, but also a new way of doing progressive politics. And it was these challenges that gave rise to the first progressive governance meeting in Florence in 1999, and subsequent gatherings in Poznan (a small town near Berlin), Stockholm, London and elsewhere. The discussions at these meetings were often characterized by an intense debate about how best to strengthen democratic institutions, stimulate higher growth, and improve social justice. This was progressivism in action. During these discussions we challenged traditional progressive policy paradigm. For example then, the German Chancellor Gerhard Schröeder’s approach to innovation and change in labor relations was highly controversial. Liberalizing the labour market seemed counter-intuitive to many. Yet Schroeder illustrated it was possible to do it in line with Social Democratic values. Through the policy of flex-icurity, his government helped workers adapt to the changes brought by global competition by helping to support unemployed worker’s income and providing better training to learn new skills and perform new tasks. These reforms have since been crucial to the success of the German economy. Nowadays, in 2015, the world has changed and many global issues had taken place. 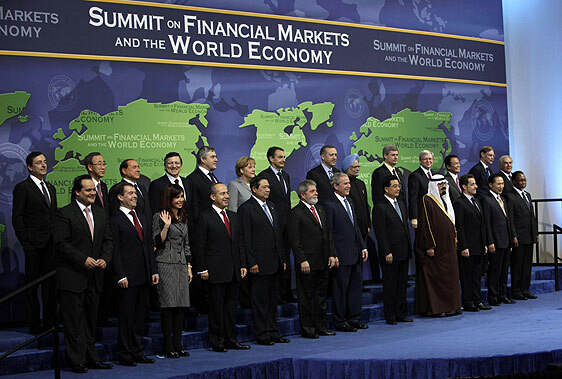 The global economic crisis of 2008 has posed a significant challenge to progressive politics. This crisis raised profound questions about a neoliberal ideology that favored deregulation of the economy and allowed the financial system to self-regulate. Even prior to the crisis, a wave of unbridled capitalism swept across the globe. After the crisis, all political leaders – from President Bush to President Obama, President Sarkozy to President Hollande, Prime Minister Brown to Prime Minister Cameron – rejected the idea of self-regulation in the financial markets. The global economic crisis, like the fall of the Berlin Wall earlier, also required a strong reflection of progressive politics. This single moment forced everyone to discuss how the international economic system was governed. It is somewhat ironic that it was the conservative President George W. Bush who called the first G20 leaders meeting. Yet by September 2008 it was clear that the G7 (or 8 with Russia) was no longer capable of responding to the crisis alone. The participation of leaders from emerging economies was now necessary. Just as there was a need to bring a new institution to life, so there was a need to forge an active consensus on how to respond. On reflection, it is remarkable that in March 2009 Gordon Brown’s leadership of the G20 was able to provide such a clear and concise response to the economic crisis. The London Summit he hosted helped the world avoid depression, creating as it did a consensus on the need to quickly revive the economy with new capital flows. It took just 30 minutes for the G20 to agree to raise IMF capital reserves from US$250 billion to US$750 billion. It was at the next G20 in Pittsburgh, however, when this consensus began to unravel. The differences in strategy began to emerge, and the lack of a common progressive vision became apparent. While, President Obama stressed the need to revive the economy through investments similar to Roosevelt’s approach to the New Deal, in Europe an austerity politics began to take hold. Social democrats, at least in Europe, had lost the argument. Looking back, it is hard to determine why the progressive collaboration that seemed so obvious in Florence and Poznan was not possible after the crisis? Why did progressives not use the crisis as an opportunity to have their say? President Clinton and I had a conversation at the New York’s UN General Assembly in September 2000, by then he already suspected that progressives were beginning to lose the argument. I thought it was peculiar the possibility that George W Bush could be set to defeat Al Gore. President Clinton himself had already snatched the classical Republican flags of balanced budgets for progressives. Over the course of his Presidency he had proven progressives not only took macro-economic matters seriously, but moreover that we were better at delivering on them. He, alongside other leaders from the progressive governance era had illustrated that true social democrats were not populists, and that we did not believe in shortcuts. On the contrary, we believed in hard work, which is very different, as Wim Kok, the former Prime Minister of The Netherlands said. Seven years on from the global economic crisis, we should not be surprised there has still not been a full economic recovery. A full recovery would have required an unequivocally progressive response. Looking ahead, we must hope that a new generation of European progressives, led by Matteo Renzi and Manuel Valls, will succeed where others have failed. For if they fail, less responsible populist leaders have shown they are waiting to seize the opportunity. Prime Minister’s Renzi and Valls are right when they emphasize the need to focus on growth to reduce inequalities and — in particular — to pay down the tremendous deficits that have accumulated through economic stagnation. It is a paradox that countries that were, only a short time ago, held up as an example of good governance — for example, Spain — had to incur large fiscal deficits to save the financial sector and now encumber their entire population with insurmountable debt. This is a serious failing of the social democratic response to the crisis, one that now challenges the legitimacy of democratic institutions themselves and that feeds the anger and alienation of a dangerous populism on the extreme left and right. It is time for a new approach in Europe. Similarly, in Latin America, the answers of yesterday are also not an effective response to today and future´s challenges. Over the last 20 years Latin America has seen profound changes in its economy and its social fabric. Chile, is an eloquent example. Between 1990 and 2010 not only democracy has been consolidated, but the proportion of people living in poverty fell from 40 percent to just 10 percent. During the same period, GDP per capita raised from approximately US$ 5,000 to US$ 20,000, with only slight increase in levels of inequality. A new emerging middle class, with ample access to credit and higher education, but also highly indebted, has developed. The same is true in Brazil, Peru, and many other countries across the continent. This new and emerging middle class is an opportunity for the region and the globe. Providing as it does a consumer base for local and international goods and services. But, if progressives don’t provide the answers to their need for better public services and economic growth, this opportunity may be lost. Across the globe, then, there is a world of new challenges ahead; new challenges that can become opportunities with a new way of thinking. As we have done before, progressives must once again lead the way with new analysis and new ideas. It is time for a new generation of progressives to answer the eternal questions of how to deepen democracy, achieve greater social justice, and ultimately, how to build an inclusive society that ensures the dignity of every human being and in where everyone has their place in the sun.